Declaring 'checkmate' to the Spring/Summer season. Gingham check is back on track. I even want to quote the lyrics of a known, to every Russian person, group Lube's song 'Checks': "Mom, sew me pants that are trendy with checks that are more visible... I walk very carefully and try to impress the world. You can even play chess on my pants... " (thanks to Intars Busulis this song is now known by my young mind, maybe not only mine. Have to confess here that I spend Sunday evenings watching the show Toch-v-toch only because of this talented and humble Latvian). And even though gingham doesn't really remind you of a chessboard, and even though this check type is not always visible from far behind, you can't deny that the song came in useful, at least, to cheer ones mind up. This season is going to be characterized by a re-birth of this simple yet attractive pattern. By the way, a bit from gingham's history. Did you know that the word 'gingham' came from Malayan language and means... STRIPED! Funny, but it's a fact that once upon a time gingham used to characterize striped fabric. And it was only the second half of the 18th century, when Manchester-based weavers introduced checked version. Oh those English people, who did change the history of gingham! So it was the 20th century, when check finally displaced striped version and became the one and only successor of the word 'gingham'. You can find more of the pattern's history at The Best Guide. Meanwhile, we are going back to the season's trend which was offered by designers not only in different check sizes (from very little to pretty big, so to say, visible), but also in various colors - standard black and white and, predominantly, in blue and pink shades, though, you can also find such colors, as yellow, green, orange and even red. According to our tradition, lets take a virtual tour? Shall we go visa verse this time and start our trend tour with details. Gingham is such kind of a pattern that is usually used in clothing rather than accessories and shoes. Well, this season we have a chance to celebrate gingham even in details. Add a bit of simplicity to your outfit with a belt or a pair of socks. Gingham-ed tops are a sort of replacement to our good old plaid shirts in cowboy style. Just like cowboy-like tops gingham ones are also a synonym of casual style. Plus it goes in every option possible- starting with cropped tops and finishing off with long sleeved shirts. Any occasion ready. Little gingham checks, medium gingham checks, big gingham checks - it's all about the bottoms. As usual with our trendy reports, 'bottoms' section is filled with skirts, trousers and shorts of any style, length and fabric possible. So it'll be pretty natural to diversify your gingham wardrobe with different bottoms in different check size. Suits are getting popular with every minute. So I can't see why we shouldn't include gingham in our a la suit list. Skirts and blazers. blazers and trousers. Denim or tweed. 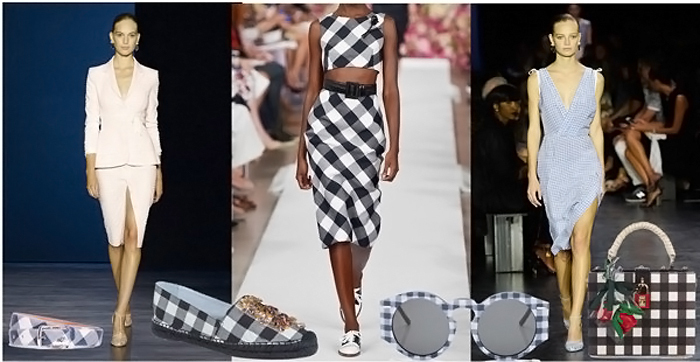 Designers seem to keep it pretty cool and diversified for gingham coordinates this season.